any variables from the global scope. So, chances are you’ve already used closures without even knowing it. But our aim is not just to use them – it is to understand them. If we don’t understand how they work, we can’t use them properly. For that reason, we are going to split the above closure definition into three easy-to-comprehend points. Point 1: You can refer to variables defined outside of the current function. In this code example, the printLocation() function refers to the country variable and the city parameter of the enclosing (parent) setLocation() function. And the result is that, when setLocation() is called, printLocation() successfully uses the variables and parameters of the former to output “You are in Paris, France”. Point 2: Inner functions can refer to variables defined in outer functions even after the latter have returned. This is almost identical to the first example, except that this time printLocation() is returned inside the outer setLocation() function, instead of being immediately called. So, the value of currentLocation is the inner printLocation() function. As we can see, printLocation() is executed outside its lexical scope. It seems that setLocation() is gone, but printLocation() still has access to, and “remembers”, its variable (country) and parameter (city). A closure (inner function) is able to remember its surrounding scope (outer functions) even when it’s executed outside its lexical scope. Therefore, you can call it at any time later in your program. Point 3: Inner functions store their outer function’s variables by reference, not by value. Here cityLocation() returns an object containing two closures – get() and set() – and they both refer to the outer variable city. get() obtains the current value of city, while set() updates it. When myLocation.get() is called for the second time, it outputs the updated (current) value of city – “Sydney” – rather than the default “Paris”. So, closures can both read and update their stored variables, and the updates are visible to any closures that have access to them. This means that closures store references to their outer variables, rather than copying their values. This is a very important point to remember, because not knowing it can lead to some hard-to-spot logic errors – as we’ll see in the “Immediately-Invoked Function Expressions (IIFEs)” section. 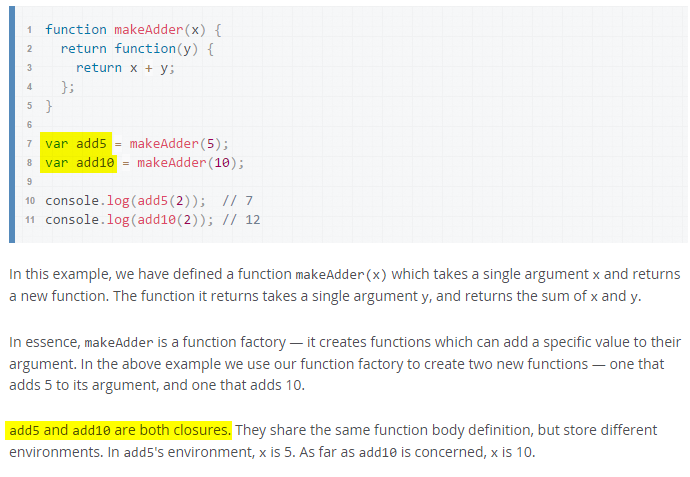 One interesting feature of closures is that the variables in a closure are automatically hidden. Closures store data in their enclosed variables without providing direct access to them. The only way to alter those variables is by providing access to them indirectly. For example, in the last piece of code we saw that we can modify the variable city only obliquely by using the get() and set() closures. We can take advantage of this behavior to store private data in an object. Instead of storing the data as an object’s properties, we can store it as variables in the constructor, and then use closures as methods that refer to those variables. As you can see, there is nothing mystical or esoteric around the closures – only three simple points to remember. Another example is when we attach an event listener to an element on a page. By doing that we’re actually providing a pointer to a callback function that will be called when the event occurs. Here we create a function fullName() that takes three arguments – two for the first and last name, and one for the callback function. Then, after the console.log() statement, we put a function call that will trigger the actual callback function – the greeting() function defined below the fullName(). And finally, we call fullName(), where greeting() is passed as a variable – without parentheses – because we don’t want it executed right away, but simply want to point to it for later use by fullName(). We are passing the function definition, not the function call. This prevents the callback from being executed immediately, which is not the idea behind the callbacks. Passed as function definitions, they can be executed at any time and at any point in the containing function. Also, because callbacks behave as if they are actually placed inside that function, they are in practice closures: they can access the containing function’s variables and parameters, and even the variables from the global scope. What we’ve done here is to put the repeated code pattern (console.log(item) and var date = new Date()) into a separate, generic function (publish()), and leave only the specific data inside other functions – which are now callbacks. That way, with one and the same function we can print information for all sorts of related things – messages, articles, books, magazines and so on. The only thing you need to do is to create a specialized callback function for each type, and pass it as an argument to the publish() function. An Immediately-invoked function expression, or IIFE (pronounced “iffy”), is a function expression (named or anonymous) that is executed right away after its creation. You need to add a pair of parentheses at the very end (variant 1), or right after the closing curly brace (variant 2), which causes the function to be executed immediately. Second, a semicolon is required at the end of an IIFE, as otherwise your code may not work properly. })("Jackie Chan", "actor");   // output: My name is Jackie Chan. I'm an actor. In this example, the first console.log() statement works fine, but the second fails, because the variables today and currentTime are made local thanks to the IIFE. We know already that closures keep references to outer variables, and thus, they return the most recent/updated values. So, what do you think is going to be the output of the following example? You may have expected that the names of the fruits would be printed one after another at one-second intervals. But, in practice, the output is four times “undefined”. So, where is the catch? To fix the problem, we need to provide a new scope – for each function created by the loop – that will capture the current state of the i variable. We do that by closing the setTimeout() method in an IIFE, and defining a private variable to hold the current copy of i.
var current = i;                    // define new variable that will hold the current value of "i"
For a more detailed and in-depth explanation of the topics presented here, I recommend you take a look at Kyle Simpson’s You Don’t Know JS: Scope & Closures. A closure occurs when a variable or function defined inide of the inner function's scope continues to be accessible to the outer function even after the inner function has returned. Just about the exact opposite of what you said. Actually the article got it right. A closure is an inner function that has access to an outer function's variables. And in fact the MDN article you referenced says the same. Inner functions always have access to outer functions variables - a closure is only created if those variables remain accessible after the outer function has closed. Let's be clear about something first. This isn't the same argument you made above. The outer function never has access to the inner function's variables. Rather, the inner function has access to the outer function's variables. The article didn't get it backwards, you did. And finally, I would agree that a closure only seems useful if we use the inner function sometime after the outer has finished, but if we're going to get technical, then the closure is actually created at the moment that we create the inner function. My two arguments appear to contradict one another because I was inconsistent in my use of inner and outer. There are actually three levels of functions involved in creating a closure and in my first argument I was using inner to refer to the innermost of the three and outer the middle one. In the second argument I was using inner for the middle one and outer for the outermost. 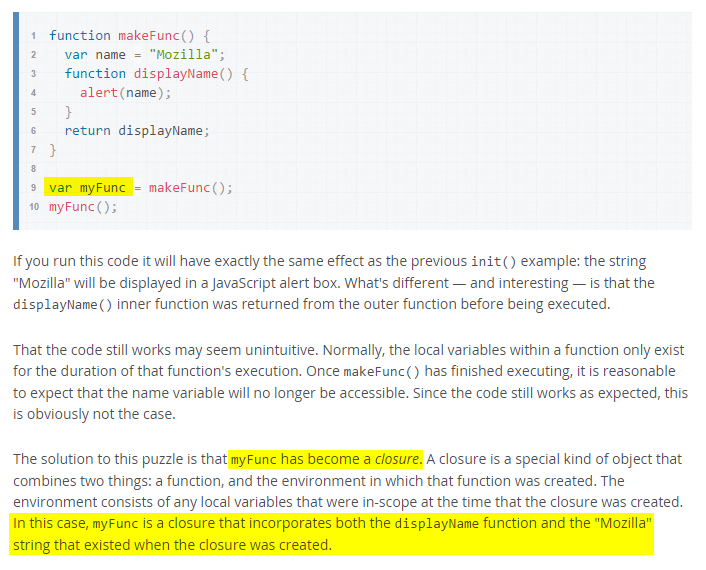 Unfortunately that isn't really an example of a closure. That's just a plain old return value.